Search Optics’ Mobile Strategy increases in-market dealer contact as much as 200%. The extreme growth in consumer mobile usage is helping dealers sell more vehicles. Mobile shoppers provide hot in-market opportunities for Dealers with an established Mobile strategy. The quality of mobile in-bound sales and service leads come from consumers that are buying today. 88% of people who do a mobile search take action within 1 day (phone call or visit). 43% of local searchers on a mobile device physically show up at the business location. Mobile web adoption is ramping up 8x faster than desktop web did in the mid 1990’s. ComScore reports US Smartphones ownership is nearly 42% and new Smartphone sales account for 60% of all phones sold (compared to only 20% in 2009). Mobile devices by nature are action oriented. On-the-go consumers are using their devices more than ever before while vehicle shopping. 51% of Mobile consumers use Search during the shopping process. 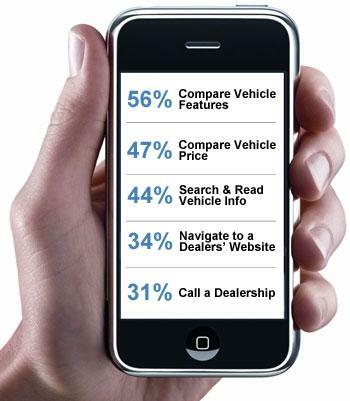 47% of Mobile users, use their device to compare price while on the dealer lot. An even portion of consumers are accessing mobile information through a browser or an app. Search Optics specializes in Mobile websites and apps that provide the power of your primary website with design and functionality that connects with mobile shoppers. Being found and being first in search results is critical in maintaining a competitive edge. Search Optics optimizes Mobile search engine results in real-time to drive a greater share of in-market Mobile buyers. Search Optics approach is delivering as much as 200% increase in lead volume directly related to Mobile sites and Mobile paid search investments. Contact Search Optics for Smarter Mobile Solutions and Better Results. The post Search Optics’ Mobile Strategy Reaches Hottest Leads appeared first on Search Optics Blog.